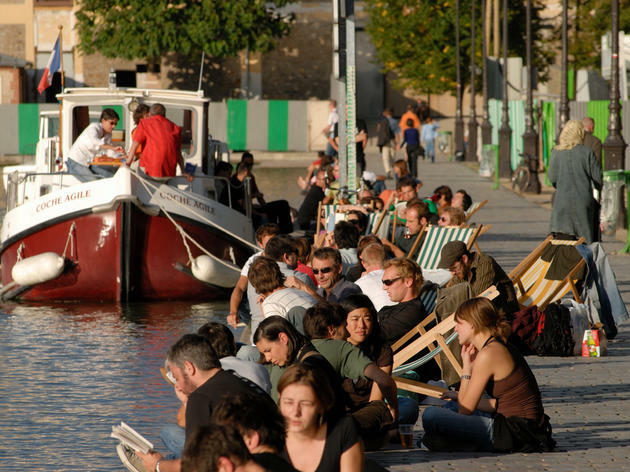 If chilling on a deckchair on the banks of a canal or playing pétanque gets you going, head to Bar Ourcq of an evening, where a flip-flop wearing, shorts-sporting clientele is welcomed with open arms. 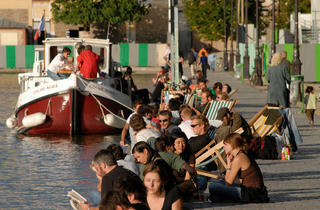 On summer days, crowds gather for open-air guitar jamming sessions or to picnic on the banks of the canal, refuelling at Bar Ourcq with plastic goblets of cold beer or bottles of wine. Things get pretty boozy as the day wears on, leading many a pétanque player to squint uncertainly at their target, and every throw draws ‘oohs’ and ‘aahs’ from the audience of fellow drinkers. It’s much less busy here than on the Canal Saint-Martin, with no passing cars to pollute the tranquil atmosphere. What’s more, you can eat and drink for next to nothing, with drinks from €2.5 and savoury snacks from €1.5. Apart from the busy summer terrace, the winter months offer many cosy corners in a cosy, pouf-strewn bar area where those in the know come to spend afternoons indulging in books, board games and free Wi-Fi. In sunnier months, DJs play electro from 5pm, the perfect soundtrack to celebratory after-work drinks in front of the sunset – and they spin on until midnight during the week, 2am at the weekends. Bar Ourcq is one of the ever so popular bars on the Canal de l'Ourcq that is always packed in the winter and that spills out into the streets and along the side of the Canal in the summer. Basic, non-fancy drinks and good music (often dj sets) make this a popular place to hang out with friends. They allow you to take your beer outside so that you can play"pétanque" (bocce balls) or sunbathe during the day! They also have various snacks for those who are hungry! A fun and lively bar where you're sure to meet some locals and have a good time!